So… Believe it or not, I was actually going to skip Burger Bar, even though it was right where I was staying, had a vegan option, and had positive reviews on quarrygirl.com. Why?! While I may be able to tolerate mushrooms a little bit more these days, I’m still chopping them into tiny little pieces and pushing discernable mushroom shapes aside. 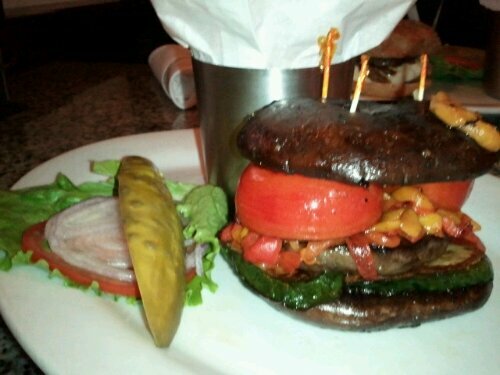 Mushrooms are just not my thing, and the Vegas Vegan $13, uses two giant portabella caps as the bun. Besides, Jenna gave me the heads up that it was just kind of okay. Essentially it’s a plate of roasted vegetables stacked up in the shape of a burger, very delicious vegetables, except for the mushrooms of course! However, Thomas was able to get away for an hour the day of the Latin Grammys (the reason we were in Vegas; He’s a set designer) and it was right there, so went for it. Burger Bar has an immense beer selection of both draft and bottles, craft and popular. So we were pretty happy about that too. 😀 Here is the link to a small version of their menu. So here is my pretty little plate. Served with the usual burger fixin’s (pickle was great!) and a generous portion of fries. I swapped sweet potato fries for the “skinny fries”, as everyone had suggested, and they were indeed good, though they got a bit soggy sitting in the paper cone. When I removed the toothpicks the “burger” it held its shape, but there really isn’t a way good eat that slippery stack with your hands. I pushed one of the caps aside to make it both more bearable to me, and small enough to keep the layers, but get it into bite sized pieces. The roasted veggies were fantastic and helped to mask the portabella well! For the record, I did try to eat some of the straight mushroom cap, and failed. (It’s really a texture thing for me; mushroom’s just make me want to gag.) Oh well! Verdict: It was tasty, and the fries helped to make it more filling, but it really wasn’t that substantial of a meal; I really hate when I have to eat chips or fries to fill up. If you’re craving an awesome beer and something to nibble on, give Burger Bar a try. I wouldn’t recommend it for dinner though. Well, unless you’re having beer for dinner! The beers are available to go as well, and they even have some 22oz-ers and special editions. 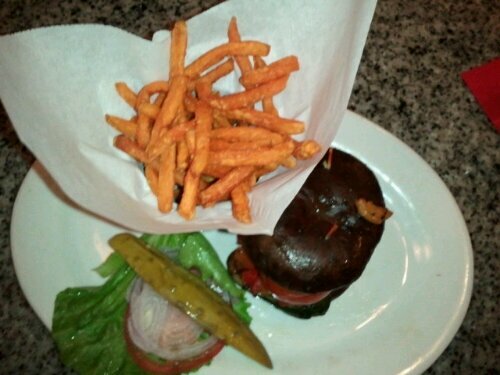 Burger Bar is located in the Shops of Mandalay Bay, Mandalay Place, just before the Luxor and across from lots of vegans’ fave body store, Lush. Open 11:00am – 11:00pm Sun – Thurs, and 11:00am – 1:00am Fri – Sat. 702-632-9364.